Metropolis conference in Nagoya, Japan. 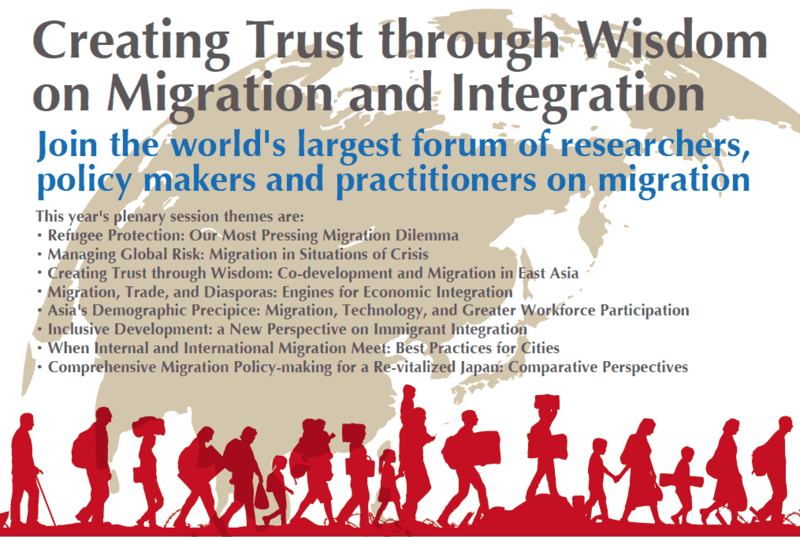 Metropolis is an annual event linking migration researchers and policy makers to improve policy making and implementation via research. Metropolis 2016 was held for the first time in Asia, a recognition of the region with 60 percent of the world’s people and 30 percent of the world’s migrants. Migration is rising in Asia, which includes some of the world’s most demographically and economically different countries. For example, the city states of Hong Kong and Singapore, as well as Korea, have some of the world’s lowest fertility rates of 1.3 children per woman, while women in Afghanistan average over five children each. Three major themes recurred during the weeklong sessions and workshops. First, the arrival of over a million asylum seekers in Europe in 2015 stimulated world leaders to reaffirm the importance of protecting migrants and to cooperate to improve the management of migration, as reflected in the September 19, 2016 New York Declaration (http://refugeesmigrants.un.org/summit). World leaders pledged to protect the human rights of all refugees and migrants and to strengthen the positive contributions of migrants to their host countries. Second, migration in Asia is highly variable. The East Asian countries of China, Japan, and Korea have relatively few migrants and aging and shrinking populations, but they are turning more to robots than to opening doors wide to migrants, with exceptions for highly skilled foreigners, students, and some guest workers and trainees. The ASEAN countries are committed to closer economic integration between 10 very different countries, from the richest city state of Singapore to the poorer Cambodia, Laos, and Myanmar. The Gulf oil exporters that depend on Asian migrant workers to fill most private sector jobs are engaged in nativization programs to encourage burgeoning youth populations to accept jobs now filled by migrants. Third, migration’s complexities in Asia may hold lessons for Europe and the Americas, allowing industrial countries shaped by emigration and immigration to assess the very different conceptions of migrants in the world’s most populous continent. With the exception of marriage migration, Asian governments often see migrants in functional terms, as tourists, students, or workers, not as newcomers to be integrated in ways that shape and reshape host societies. This means that Asian migration policies often emphasize ensuring that migrants leave after their visit, study, or work ends. In reality, more migrants are making careers in Asian countries, but they are not yet accepted as members of their new societies. Metropolis will return to Europe in 2016, where the focus of research and policy interest is likely to be on integrating Syrian and other newcomers who have been recognized as refugees and returning those found not to be in need of asylum. With many European countries holding elections in 2017 in which anti-migrant parties are expected to do well, research to improve policy making and implementation is likely to remain of great interest.